Send me your pictures, ideas, etc. and I'll create you a one of a kind design. 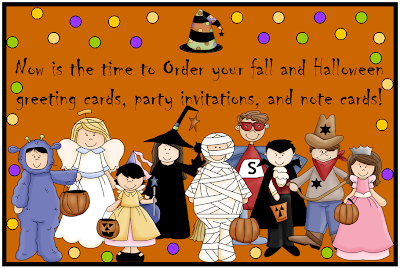 Those of you who are not into Halloween, I have lots of great fall stationery ideas for cards or parties too. Just email me at leeandceleste@yahoo.com, and I'll be taking orders until the middle of October. If you are one of those people (like myself) who think really far in advance, you can go ahead and put in your order for Christmas cards and personalized gifts. Thanks for your business!